Is your team greater than the sum of its parts? 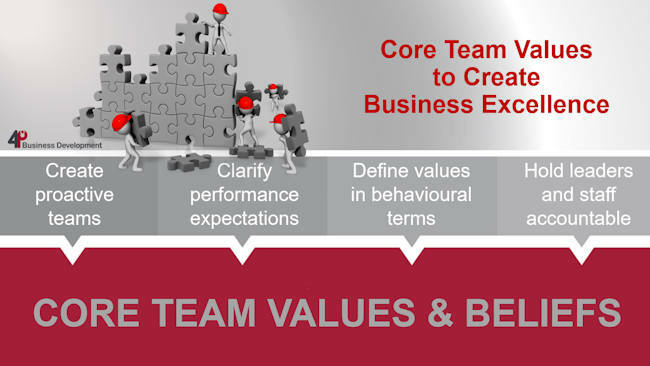 Do you want to know how how core team values can create business excellence? Many of us are less interested in generically stated core values as they are rarely reflected in our team or company cultures; however, there is obviously a need for any business owner to define their values for teams to embrace clearly. If a team can get these core values right, success and a rewarding sense of teamwork will follow. It’s not always the task at hand that challenges teams in their progress, it’s the relationships and the little things that happen day-to-day. Consider how you and your business can support a sense of shared responsibility and embrace the ‘we’ proposition across the business thereby engaging employees in more meaning manner with better outcomes. Moreover, with successful teamwork, there is a good relationship between the employees. There is goodwill and understanding between the members. They also know their importance and the importance of the work that they do in relation to the success of the company. Teamwork is really important in achieving the overall goals of a company and this ensures that the work is completed on time to a high-quality standard. The group also receives all the rewards and recognition of a job well done. Furthermore, teamwork will eventually lead to the success of both the company and of all the individual employees involved, utilising core team values to create business excellence. You may feel like you want to learn more about how core team values can create business excellence, so do call me on 01280 700405 or click here to ping me an email and let’s see how I can help you. By far the most common problems that arise in my client’s businesses are around people issues. Are you taking the time out to recognise the keys to your company’s success? The best companies can both retain and promote the right people. They create a development plan to instil the qualities they want to see in all their current and future leaders. Create a coaching programme to develop your team. However, be careful with a rigid programme, run by ‘by the book’ staff it can sometimes stifle creativity. To avoid this, the coach must challenge and help people to discover their limits on their own. You don’t want someone reaching the executive suite having lost all their creativity and problem-solving skills because ‘that’s the way we’ve always done it here’ do you? Always seek out opportunities to publicly recognise individuals (of whatever level in your business) for their originality and ability to find unique solutions to problems. By praising a particular behaviour, you’re shining a spotlight on attributes you desire, significantly increasing the likelihood of replication throughout your organisation. For long-term sustained success, it is vital to assemble leadership teams comprised of individuals who are content on both home and work fronts. If someone isn’t happy outside the office, eventually that will cross over into the workplace. Who are your rock steady performers? Do you recognise them? Those on your team who seek out and work with the “unicorns” and lead the most profitable business units probably don’t lack in the recognition category. However, the steady, unflappable performer you can depend upon often go unnoticed. Their steadiness doesn’t command attention but it should be recognised. Business strategy is too often focuses on financials and quarter-to-quarter progress. In defining your company’s less overt drivers and recognising those who lead in those categories, you can create more of a good thing. 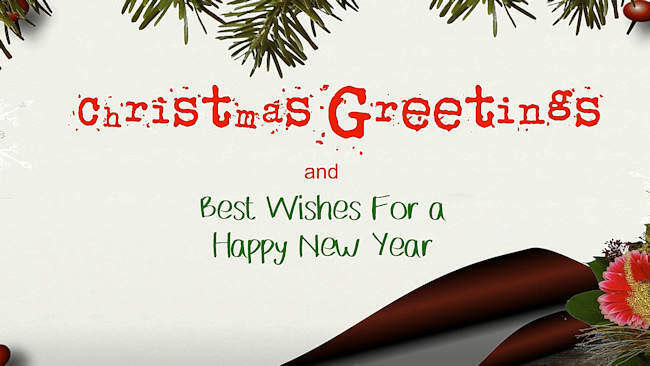 Merry Christmas from all of us at 4P Business Development and we’ll be back in the new year to offer you more insights into your people, planning, positioning and processes, ultimately leading you to improved profitability. 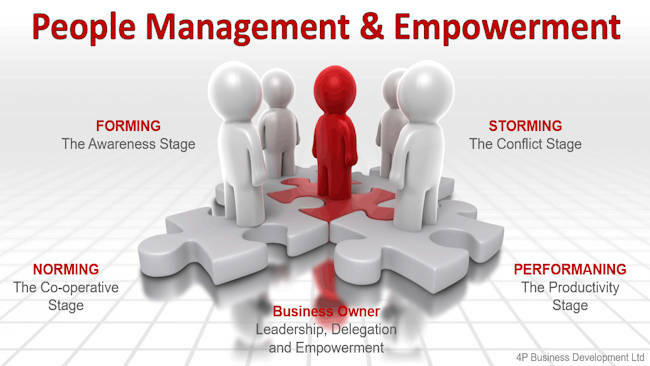 Good people management is key to your business reaching its goals and objectives! “Do you have the right people in your business? Too many managers employ people to match the job role that is currently in place. However, great managers seek an employee with the style and type that suits their business culture, whose skills and talent can redefine how that job is carried out, adding productivity and profitability to the bottom line. Both people development and organisation development focuses on your actual business – its people, its teams and its leaders – and ensures that it grows in a way which supports your business and its objectives. Through two key programmes, my Organisation Development group will work with your teams and groups of leaders in your company to help produce the results you need to develop your organisation and its culture. You can learn how you and your team can work together to raise your game with our Breakthrough Team Development programme. Establish stronger leadership and relationships in your teams and dramatically improve both the quality of your results and your experience of working together. My team and I work with the whole of your business and you, its leader, to resolve issues of measurement, performance and role clarity, along with attitudes, beliefs, communication and values. The second of our programmes helps you to develop your leaders through a process linked to achieving the most desired results for your business with our Breakthrough Leadership Development programme. This is specifically designed to cause changes in leadership behaviour that can be integrated into your business. My approach is an in-depth exploration of leadership through immediate, practical and applicable projects. It is a most reliable, sustainable and cost-effective way to ensure that what is learned is relevant to your organisation. Storming: The conflict stage is more risky as personal issues are opened up and the team becomes more inward looking. There is more concern for the values, views and problems of others in the team. Norming: The co-operative stage, confidence and trust begin to emerge, together with a more systematic and open approach, leading to a clearer and more methodical way of working. There is greater valuing of people, clarification of purpose, establishing of objectives, systematic collection of information, considering of all options, preparation of detailed plans and progress reviews to make improvements. Performing: Evidence of the productivity stage includes flexibility, leadership decided by situations, not protocol, everyone’s energy is utilised and basic principles and social aspects of the organisation’s decisions are considered. I will work with your organisation to create a business that ensures that it grows in a way which supports your goals and objectives. And I will teach you to lead in a way that makes it easy for others to want to follow, setting the right example by your own business behaviour. If any of what I’ve written in the blog post resonates with you, call me on 01280 700405 or click here to send an email enquiry and let’s see how I can help you to use Personal Profile Assessments, to recruit, retain, develop and manage the best people. If your limiting beliefs are holding you back, then maybe I can help you? The biggest difference between successful business owners and less successful ones has nothing to do with the number of challenges that they face, but the skills they have in solving those challenges. They unshakably believe that they have the ability to achieve whatever goals they set for themselves and make positive choices in their lives. You know you need support in problem-solving when you want something very much, really want to achieve your goals or want to change something in your business. Yet you continuously face roadblocks that make you feel threatened and make you feel helpless, incompetent, unworthy or just stuck. What is most likely stopping you and getting in your way is negative ‘schemata’ (beliefs) that can influence and hamper the uptake of new information and is based on past experiences, or negative core beliefs around what you are actually capable of achieving. You are invariably taught these beliefs by your parents, siblings, peers, friends, associates, teachers and other people in authority when you were younger. Albeit that these core beliefs were formed early in life, you definitely were not born with them. Most of these beliefs you will not remember learning, but they become part of you and your identity. They set your sights and establish your core fears, often keeping you stuck and feeling helpless. Should you find that some of these limiting beliefs are getting in your way, then it’s time to consider what those beliefs are, who taught them to you and why. They are preventing you from moving forward and holding you back in your business. Feeling incompetent, a fear that you cannot do things right and deep down you possibly expect to fail. This manifests itself and gets in the way of you making positive decisions that will work. With this, often comes anxiety, stress and the fear that you will be humiliated. When you are feeling like this, it’s hard to make any decisions and the likelihood is that you will stop trying or even fail to take the first steps. Feeling unworthy, a fear that you’re wrong or undeserving. When this fear is at the forefront of your thoughts it becomes scary and you are likely to take on the assumption that you are of little importance and that you will be rejected should you ask for something or attempt to make any changes. When you are feeling like this the likelihood is that you sit back, accept the situation for what it and just hope things will get better, being totally unable to even imagine a solution that others would embrace. Feeling unsafe, this is a fear that everything is uncertain and dangerous, that you cannot possibly rely on anyone or anything and even the very thought of change creates a huge predicament because you are unable to imagine what will happen. When feeling like this, you can only imagine bad or dangerous outcomes so you tend to avoid change of any kind and when attempting to solve problems believe each and every solution to be far too dangerous. Feeling that others needs are far more important that your own and should always come first. This fear results in you generally giving in and defering to other people’s views and needs. You are possibly extremely empathetic and, whist you believe you and your needs are not unimportant, you tend to think that others needs are far more important than your and you will give in to their desires. This belief makes problem-solving especially difficult as you find yourself unable to embrace any solution that may be any way in conflict with the needs of other people. 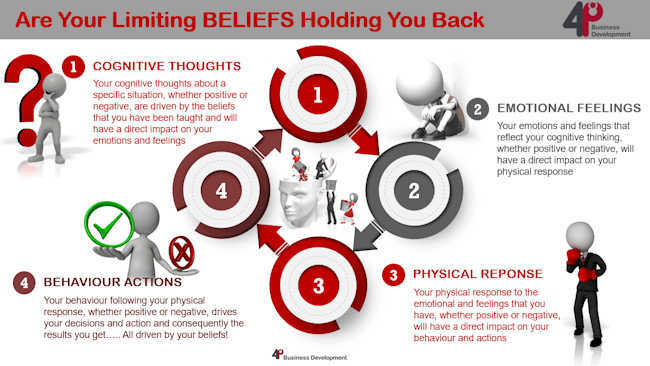 Should any of these core limiting beliefs be holding you back, you will need to ascertain the strength of the beliefs and how you may be able to dispute them and put in place a new effective belief. Your cognitive thoughts about a specific situation, whether positive or negative, are driven by the beliefs that you have been taught and will have a direct impact on your emotions and feelings. Your emotions and feelings that reflect your cognitive thinking, whether positive or negative, will have a direct impact on your physical response. Your physical response to the emotions and feelings that you have, whether positive or negative, will have a direct impact on your behaviour and actions. Your behaviour following your physical response, whether positive or negative, drives your decisions and action and consequently the results you get. All driven by your beliefs!. To begin changing any negative core beliefs, it would also help if you were to change your language and vocabulary and to ensure that you use only positive language and vocabulary and avoid all negative words such as don’t, not, no, try and hope. Furthermore, take time out to explore some of your limiting beliefs in depth, write them down and then review the ones you are going to change, listing new beliefs you would like to develop and what would motivate you to make the changes. Where did that limiting belief come from? Why might you have been taught that belief? How much do you currently believe that limiting belief? How would you feel if you could change the belief? And you will begin to realise that it is possible to dispute these limiting beliefs and put in place new positive enabling beliefs to help you move towards your goals. Would you like to know more? Call me on 01280 700405 or click here to send me an email enquiry and let’s see how I can help you get rid of those limiting beliefs and move towards your goals.